Data security and data breaches are all over the news and have the attention of your customers. With advances in technology, especially in your customer’s equipment, dealers have more access to sensitive customer data than ever before. These developments have created customer and manufacturer expectations and related legal obligations requiring dealers to pay attention to data security. Dealers and manufacturers came to us to help address these issues, and we have developed a program tailored to dealers that will guide you through this complicated area. Our Data Security Program has been developed in consultation with dealers over the course of the last two years. The Data Security Program is the industry standard for dealers and is in the process of being adopted by dealers throughout North America. The program provides information and assistance to help protect private information including business data, customer information, and data gathered from machinery. You’ll know who should (or shouldn’t) have access to customer data, and how it should be protected. The program can reduce the chances of a data breach (digital or paper) and limit the risk of lawsuits and negative publicity. It provides a robust solution to help instill customer conﬁdence, which gives you a competitive advantage. The Western Equipment Dealers Association’s (WEDA) top priority is manufacturer relations. We recognize that the most important contract a dealer will sign is their dealer contract with an OEM. WEDA regularly communicates with OEM’s on contractual and policy issues to ensure balance and fairness in the relationship. It could cost as much as $40-$60K in professional fees (attorneys, etc.) to develop a program of your own and considerable staff resources to implement it. Your company could potentially suffer a loss of customer relationships and revenue due to mistrust or misuse. You run the risk of potential lawsuits and legal costs if your company violates data breach laws. Insurance does not replace the need for a data security program. Manufacturers are expecting dealers to address data security and properly protect themselves and the brand. Does anyone on your staff have time to develop and implement a program? WEDA in cooperation with Seigfreid Bingham, PC has developed a package of model forms, an implementation guide, and a training program developed by Broadventure Management Group to help dealers with a turn-key solution. The entire package is provided at a fraction of the cost to independently develop forms and staff training. WEDA provides ongoing support: Your purchase includes access to our legal counsel and training consultants if needed. “Now that we do feel comfortable with the protection we’ve got through the documents, our business services piece will continue to evolve and grow,” says Derick McGhee, Heritage Tractor, Inc.
» The forms are available for purchase in Word format, which gives you full capability to make changes tailored to your dealership’s needs. The Association also has developed a comprehensive implementation and training guide to assist dealers with the process of standardizing operations around data privacy and adopting the information security program into daily practice. The materials include a training video to help employees understand their important role in protecting their company’s, their customers’ and their own private information. 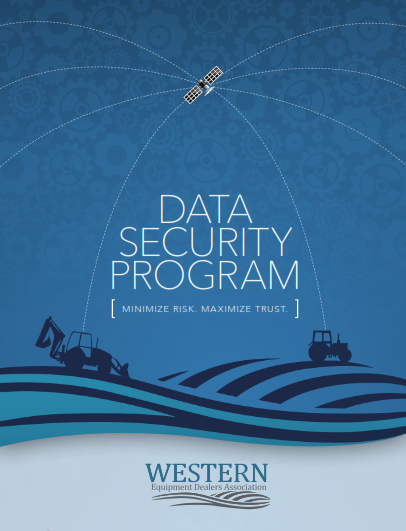 The Data Security Program includes both model documents and training-and-implementation materials. The program is designed to help dealers implement physical, administrative, and technical security for customer and equipment data collected, stored, and used by the dealership. Key beneﬁts include better protection of data, better trust and conﬁdence with customers, and reduced dealer liability. Your purchase price includes limited phone support with our consultants who assisted in the preparation of the program materials. Agreements that govern customers’ agronomic and other data in your possession (what can you collect, how can you use it, who has access to it, etc. ); establish and implement a data security policy (your customers expect this), and limit your liability. Materials that show you how to implement the program and train your employees: How to use the agreements, what organizational changes need to be made, what systems and processes need to be improved, what employees can say and what they can’t. The data security implementation and training materials are designed to help dealers understand the Data Security Program requirements and provide specific instructions to implement solutions that meet these requirements. The materials include an implementation guide, work plan, implementation training video, and an employee training video.